One of the two main unions heading the national transport strike affecting public transport buses across the country since Friday last week, has unofficially accepted the employer’s wage offer. While the South African Transport Allied Workers Union (SATAWU), which has the majority of members nationally, maintains their demand for an 18 percent wage increase across the board, the Transport and Omnibus Workers Union (TOWU) which has majority of members in the Western Cape, has said they would accept the offer of a nine percent increase across the board. “TOWU demand is still agreeing to the CCMA Commissioners Proposal of nine percent,” said union spokesman Tony Franks today. “We agree with the current offer,” said Franks. But SATAWU spokesperson Vincent Magosa said they were not budging from their demand of an 18 percent wage hike. “Our demands have not changed. We want an 18 percent increase across the board,” said Magosa. Magosa said SATAWU leadership cannot decide on behalf of its members to accept the nine percent offer. He said SATAWU’s views would not be “dictated” by other union. 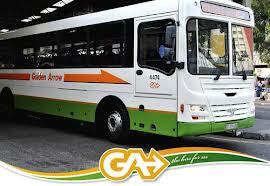 In the Western Cape the Golden Arrow Bus Service suspended its entire service on Friday following unions’ refusal to accept the employers proposed wage increase percentage, said bus company spokesperson John Dammert.